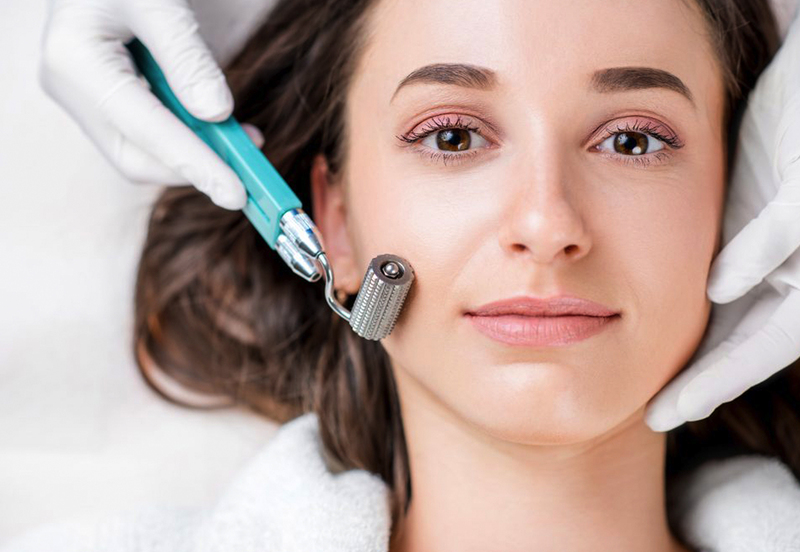 Dermaroller is a device which delivers 1000’s of micro surgical needle insertions rapidly and enables the practitioner to adjust speed and depth to suit the area of skin and indication for treatment. Because the needle insertions are so rapid, this is a pain free treatment. When the skin is injured, the injury or wound triggers a natural healing response, cells are stimulated to create new, stronger collagen, elastin and hyaluronic acid to repair the injury. Because this technique retains a healthy epidermis (the surface layer of the skin) the resulting repair leads to a healthier skin, both in appearance and function. This new collagen and elastin production will continue for 12 months with each treatment. This is not a painful treatment, indeed, patients describe it as quite pleasant and relaxing. To ensure your comfort, we do apply a topical anaesthetic cream to numb the skin prior to treatment. Since this treatment relies upon natural processes and causes only micro fine, controlled injury to the skin, it is considered very safe, when the appropriate devices are used in trained hands. The optimum result is achieved over a course of treatments and over a period of months. Depending on the treatment indications a course of between 3 and 5 treatments 4-6 weeks apart will be recommended. Most patients report a notice improvement after the first two weeks and report skin feels smoother, softer and looks fresher, but the real changes occur from about 12 weeks. Skin quality continues to improve for up to 12 months. All make up will need to be removed prior to treatment, so please come ‘fresh faced’ if possible. Alcohol, aspirin, Ibuprofen and a range of dietary supplements including; St. Johns Wort, fish oils, Gingko Biloba, Vitamins C and E- may all contribute to bruising and are best avoided 24 hours before treatment. Treatment cannot be administered if there is an active skin infection, including acne or cold sores or if you are unwell- including colds, coughs, sore throats etc. Do contact the clinic to discuss any illness or new medicines prior to attending. Immediately after treatment your skin will be pink. Degrees vary from one individual to another, from pale pink blush to beetroot red. Any redness is expected to resolve steadily over hours, sometimes it may take 3 or 4 days to return to normal colour. Make-up can be worn the next day. If redness worsens, or itching occurs in the first few hours after treatment, cold compresses, or an anti-histamine tablet will help to resolve any discomfort. Use only the recommended products until skin colour returns to normal, then usual skin care may be resumed. SPF 30 or above should be worn daily during the course of the treatment. You are advised to avoid alcohol, vigorous exercise, and extremes of heat or cold for 48 hours post treatment. These activities have been found to increase and prolong redness and swelling. Do not use hair dyes for a week following treatment.